On July 30, the US Department of State has published a worldwide arms control compliance report that included claims that Russia violated the 1987 Intermediate-Range Nuclear Forces (INF) treaty signed between the United States and the Soviet Union in 1987. “The United States has determined that the Russian Federation is in violation of its obligations under the INF Treaty not to possess, produce, or flight-test a ground-launched cruise missile with a range capability of 500 km to 5,500 km, or to possess or produce launchers of such missiles,” the document says. However, the report provided no evidence of the aforementioned violations. Anders Fogh Rasmussen, Secretary General of NATO, also commented on the issue, urging Russia to follow the provisions of the INF treaty. “It remains a key element of Euro-Atlantic security — one that benefits our mutual security and must be preserved,” the NATO website quotes him. According to The New York Times, the violations were also mentioned in the letter from the US President Barack Obama to his Russian colleague Vladimir Putin. “In his letter to Mr. Putin, Mr. Obama underscored his interest in a high-level dialogue with Moscow with the aim of preserving the 1987 treaty and discussing steps the Kremlin might take to come back into compliance,” the news agency says. In return, the Ministry of Foreign Affairs of the Russian Federation (MFA) has published an official statement, in which it rejected all the raised accusations and stressed the fact that the USA has provided no evidence. “Notably, the U.S. side, in its usual manner, provides no specific facts but rather replaced them, for some obscure reason, with a synopsis of the Treaty articles. Comments of the U.S. officials who refer to some ‘classified intelligence data’ also fail to clarify the essence of the U.S. claims,” says the text of the comments on the US Department of State report, which was published on the ministry website. In addition to that, the statement notes that Washington itself is in breach of the INF treaty. Among other things, the Ministry of Foreign Affairs expressed its concern over the use of short-range target practice missiles and combat unmanned aerial vehicles (UAV), as well as the plans to place the American Mark-41 missile platforms which can be used for launching intermediate-range cruiser missiles. Above that, the MFA pointed out a number of other inconsistencies in the White House’s arms control policy, such as the decision to withdraw from the Antiballistic missile (ABM) treaty in 2001, expansion of the US ABM and conventional armaments, as well as other issues concerned with nuclear tests, outer space arms, and biological and chemical weapons. In a reply to Anders Fogh Rasmussen, the Ministry of Foreign Affairs stressed the fact that NATO was not involved in the 1987 treaty. “If the NATO Secretary General would seriously want to make a contribution to the reinforcement of the INF regime, we would recommend that he thinks about making this Treaty multilateral. Russia supported this idea many times,” says the ministry in a separate commentary. The INF treaty violation accusations aimed at Moscow evoked massive response among the worldwide experts. One of them, Mikhail Krysin, a well-known Russian researcher of history of the Baltic States, author of numerous scientific publications and several books, recalled the circumstances in which the 1987 treaty was signed. 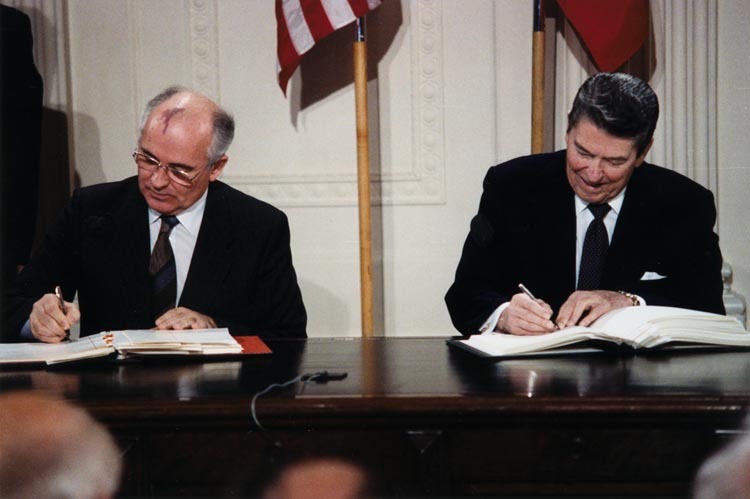 He noted that the INF treaty’s main objective was to further the disarmament of the USSR that followed soft policies towards the US under Mikhail Gorbachev. At the same time, Washington’s losses in military strength were much less notable. “The main idea of the 1987 treaty was to specifically annihilate the Soviet land-based short- and intermediate-ranged missile (SIRM) potential, which was much bigger than those of SIRM in air and naval Soviet forces. For the US, the land-based SIRM component didn’t matter much in comparison to that used in the US aviation and navy,” the expert said in an interview to “PenzaNews” agency. He added that several high-ranking Russian politicians consider the INF treaty not corresponding to the current reality. “As early as February 10, 2007, the Russian President Vladimir Putin said this treaty facilitates the US plans to place their missile platforms in Poland and the Czech Republic. Sergei Ivanov, back then the country’s Minister of Defense, called the treaty ‘a Cold War relic,’ adding that many of the Russia’s neighbors have SIRM in their forces, and therefore it would be a logical step for Russia to have these armaments too,” the historian recalled. In his opinion, a number of events in military and political areas were behind the claims by the US Department of State. “The SIRM which are in service with Russia and the US are not land-based. One of the reasons behind the accusations could have been Russia’s motions throughout the last few years to expand its non-land-based SIRM potential. However, it is certain that the main cause lies in the Ukrainian issue,” the expert emphasized. From his point of view, the claims could be a part of the current “psychological warfare” against Russia. “After Crimea, Russia is accused of everything bad that happens in the world. It is thought that Russia is to be blamed for starting the civil war in Ukraine, for the Odessa arson which led to many deaths, for the MH17 crash, and that it is a threat to the whole Europe,” Mikhail Krysin said. In his opinion, the US authorities refrain from withdrawing from the treaty in order to use it in a defamation campaign against Moscow, while Washington’s violations may end up hidden from the public eye. However, the historian suggested that Russia should nevertheless remain in the 1987 treaty and invest as much effort as possible in order to resist the White House policies. “Perhaps we too shouldn’t abandon the treaty; and in the meanwhile, use it as much as possible as a trump card in the Russia-US ‘psychological warfare,’ and at the same time expand our air and naval SIRM potential like the US does,” Mikhail Krysin explained. Further discussing the topic of the US-Russia confrontation, Igor Sutyagin, Research Fellow at Royal United Services Institute for Defence and Security Studies (RUSI), noted that the chances to find a diplomatic solution to the conflict are currently very slim. “36 months ago they said Russia will withdraw from the treaty. For the last three years, the press have been publishing the calls to cross out the INF treaty and start constructing the intermediate-range missiles. All this had been accumulating, and the red line was crossed, as far as I can recall from the Western media, last October or November — long before the events in Ukraine,” the expert said. In addition to that, he found the remarks made by the Russian MFA baseless and inconsistent, since the target practice missiles are used by both Washington and Moscow, while the deployment of American Mark-41 missile platforms is formally not a violation of the treaty. Speaking of the US combat drones, Igor Sutyagin stressed the fact that they are remote-controlled vehicles that do not self-destruct after reaching the target, which, in his opinion, makes them not covered by the provisions of the INF treaty. Igor Sutyagin also noted that the officially published data on the Russian Iskander-K guided missile system, which can be fitted with longer-range (above 2,000 km) cruiser missiles, also speaks in favor of the US claims. From his point of view, the facts listed above, along with the statements made by the high-ranking Russian officials, force NATO to see every Russian military decision or development as a potential assault, even if such steps do not endanger the North Atlantic community. “In such situation, any SIRM-related movements by Russia will be seen as a threat to NATO,” the analyst added. Pavel Baev, Research Professor at the Peace Research Institute Oslo (PRIO), also noted that the circumstances surrounding the 1987 treaty may lead to noticeable increase in tension on the international level. “The developing confrontation is no joke, and things that are tied with the Cold War legacy have troubles matching the situation. In my opinion, it is wrong to speak of a new Cold War — the situation is radically different. But certain elements of the past are surprisingly fitting for the new confrontation, which yet has no appropriate title, and become serious factors that destabilize the situation,” he said. According to the expert, in the current circumstances make Washington’s claims very serious. “The violations pointed at by the US appear to be much more direct, grave and undebatable, than those listed by Russia. This looks like a traditional attempt to parry the accusations with counter-accusations. However, if what the Americans claim to be true is true, no counter-arguments will protect against it,” the researcher stressed. At the same time, Pavel Baev admitted that the US Department of State provided almost no evidence of the alleged Russian violations. “There are some things, some technical data, which is never revealed by default, since it has a different secrecy label. I find the published information lacking as well. It’s not enough for a study. It would be good to know more what missile they were talking about, at least in the very basics,” he said. In the analyst’s opinion, it would be difficult to ensure the actual adherence to the INF treaty would be highly difficult in the current worldwide situation; however, the state of affairs is not beyond all hope. “I think that if the situation overall would have been different, the issue would be solvable, since Russia certainly wouldn’t benefit from destroying this treaty, and it’s clear that the US doesn’t want it either. The treaty is one of the few active bases for the European security system. Everybody would prefer to keep it,” he stressed. The analyst also spoke of the issue of developing and using military UAVs. In his opinion, this type of armaments requires its own regulation for a variety of reasons; however, the 1987 treaty does not cover the combat drones. Alexei Arbatov, Resident Scholar at Carnegie Moscow Center, agrees with that. “The UAVs are aerial vehicles, planes, which are remote-controlled. They are not like cruise and ballistic missiles, which receive the target coordinates, fly up, reach the target and strike it down. Obviously, drones are not the same,” the expert said. At the same time, he noted that using combat drones in the war may lead to a number of grave issues, such as deaths of innocent civilians. “It is a separate issue, very serious and very difficult in technical terms. If the sides had good relations, they would obviously be able to solve it with reasonable technical limitations, warnings and means to check the transparency,” Alexei Arbatov stressed. Dwelling on the current INF treaty confrontation, the analyst suggested that its possible solution also lies in establishing the relevant examination and verification system, but achieving this objective currently seems impossible. “In the light of the grave crisis in Ukraine, everybody understands that no one would go to such lengths,” he said. At the same time, Alexei Arbatov noted that giving a definitive opinion on the alleged 1987 treaty violations by Russia and the US is a very difficult task. For example, he said that the use of the ABM platforms and target practice missiles by the US is highly ambiguous. “The USA employ the elements of intermediate-range missiles as targets for their ABM system. The treaty says that the intermediate-range munitions, which are not designed for striking ground targets, do not fall into the SIRM classification. Among such cases are S-500 missiles and American ABMs. They may have the range of above 500 km (the minimum distance), by they are not designed for striking down ground targets and are therefore not banned by the treaty. On the other hands, these target practice missiles, since they are not destroyed, may be fitted with warheads for ground-to-ground strikes,” the expert explained. “The same can be said of the ABM platforms. If they have the range of over 500 km — and such systems exist in the US, in Europe, on Alaska — they can also theoretically be used for striking ground-based targets. A great many anti-air and anti-missile munitions may in theory be used in such way, but they were not designed for that,” Alexei Arbatov continued. In his opinion, giving a quick and definitive verdict over the Russian system in the core of the confrontation would also be impossible. “R-500 missile which caused this argument is used on the ‘Iskander-M/K’ launch complexes, and they were tested. Russia says their range is below 500 km, the US says it’s above 500 km. How do you exactly determine a missile’s range? A cruise missile may fly not in a straight line like ballistic missiles do, but use a complex trajectory. What is its general range? This is a difficult kind of question fit for the technical experts,” the analyst concluded. At the same time Said Aminov, military expert and editor of “Vestnik PVO” web-based media, suggested that in the current circumstances, the accusations by the US administration are just a part of political pressure campaign to make Russian authorities yield in a number of issues, including Ukraine. “There are almost no facts, and this is just an attempt to drag in various events to cause a worldwide-scale political pressure on the country, aiming to change the authorities’ position on Ukraine,” he emphasized. In the expert’s opinion, Washington’s declamations only escalate the current disagreements with Moscow and hinder the search for a political resolution. At the same time, the military expert found the response by the Russian Ministry of Foreign Affairs sound and substantiated. In his opinion, the best way out of the INF treaty confrontation lies in cooperation between Moscow and Washington. “Political dialogue, mutual discourse and trust, and search for the compromise: these are fundamental truths, and both sides and first of all the US must use these means to find a way to ensure the treaty works,” Said Aminov summarized.